Generosity: It's one of the hallmarks of the New Order of Highsec. 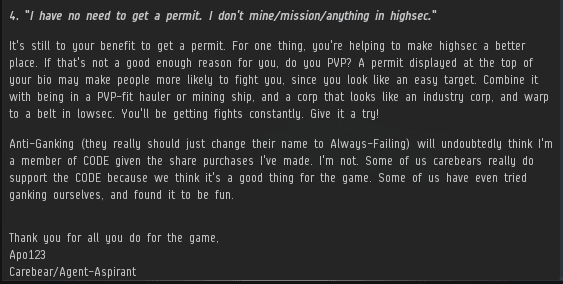 The contributor seen here was too modest to have his or her name included with the gift he or she made to highsec's future. Wow! The week got off to a strong start with Apo123's purchase of 5,000 additional shares, which sent us past the 1,157, 1,158, 1,159, 1,160, and 1,161 billion isk marks. 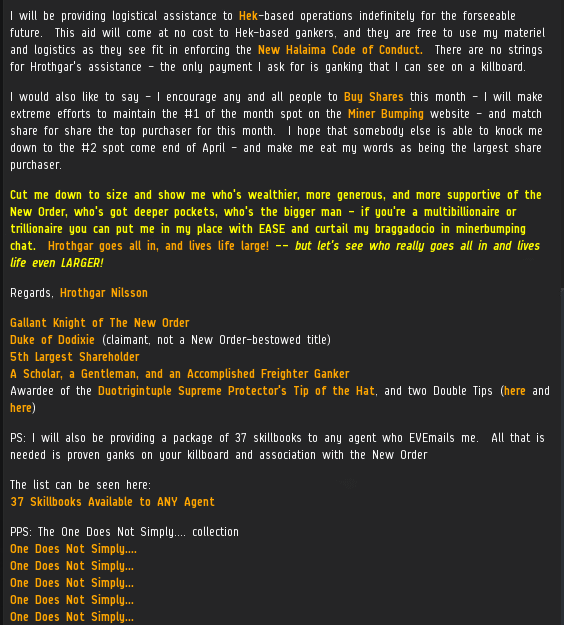 Apo123 earned a Quintuple Supreme Protector's Tip of the Hat™. Autopiloters, take note. You, too, can ascend to the level of contentment and achievement that Apo123 currently enjoys. Let's hope the carebears are listening. 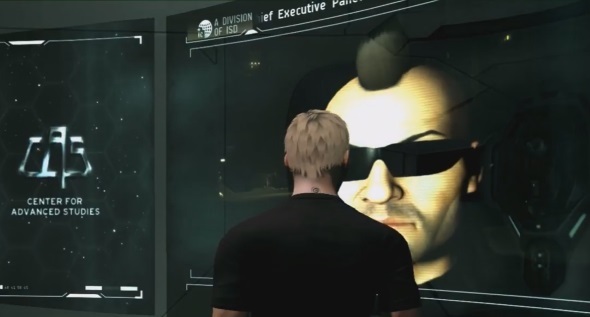 Hiasa Kite was right on target with his assessment that the New Order is the worthiest cause in EVE. 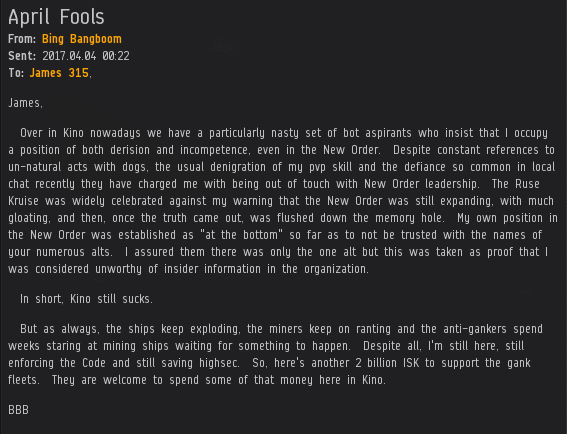 He bought 3,407 shares and rocketed us past the 1,162, 1,163, 1,164, and 1,165 billion isk marks. His investment paid off--big time--with a Quadruple Supreme Protector's Tip of the Hat™. 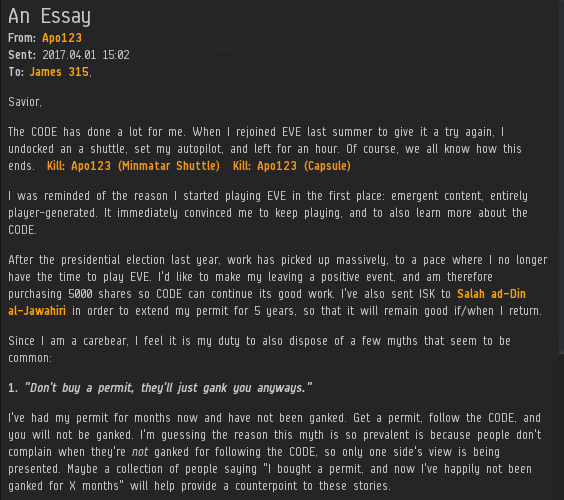 Anyone who takes a break from EVE should consider buying shares. That way, they can continue to have an impact on the game even while absent. Zander Moreau received a gift of 1,200 additional shares from his benefactor. 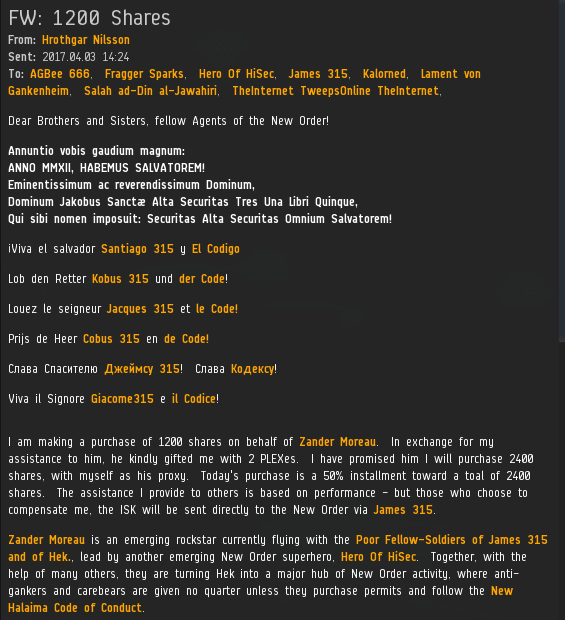 The purchase sent us past the 1,166 billion isk mark and earned Zander a Supreme Protector's Tip of the Hat™. What, you were expecting only one screencap for something written by Hrothgar Nilsson? I'm not at all surprised to hear that Kino got hit hard by the Ruse Kruise. But they still have Bing Bangboom to comfort and guide them. He bought 2,000 additional shares, allowing us to close out with the 1,167 and 1,168 billion isk marks fully reached. Bing gets to add yet another Double Supreme Protector's Tip of the Hat™ to his collection. Can any of these rebels stop him? Sure doesn't look like it. Agent AGBee 666 created a new video, this time exploring the complex intersection of the New Order, highsec minerdom, and CONCORD. It's been favorably compared to "The Wire" and is a true collaboration, with contributions from Agents Sasha Nemtsov, Jaxi Wreckful, Hrothgar Nilsson, and TheInternet TweepsOnline TheInternet. As always, links to Code-themed videos are available on the Links page. Your Holiness, James 315, and his Harbinger, Hrothgar, honors me with your tip of the hat! I thank thee for including me in the eternal annals of the New Order! :) Thank you! I am honored to have my video posted here ... James 315, your acknowledgement of my work only encourages me to push harder and go farther ... thank you! 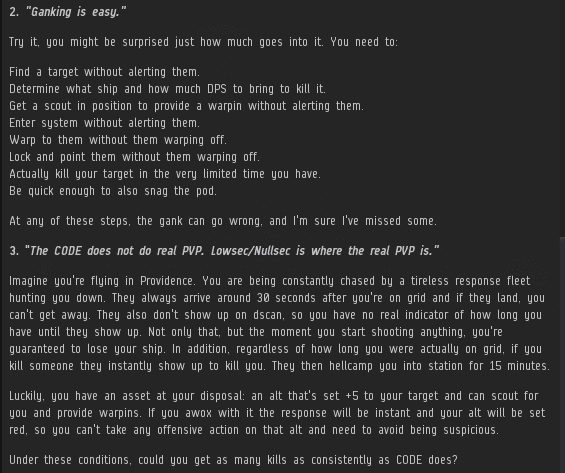 On a side note: Are the Poor Fellow-Soldiers going to be admitted into CODE. so that our kills will count for the Alliance? If corporations are enforcing the Code, then why not??? 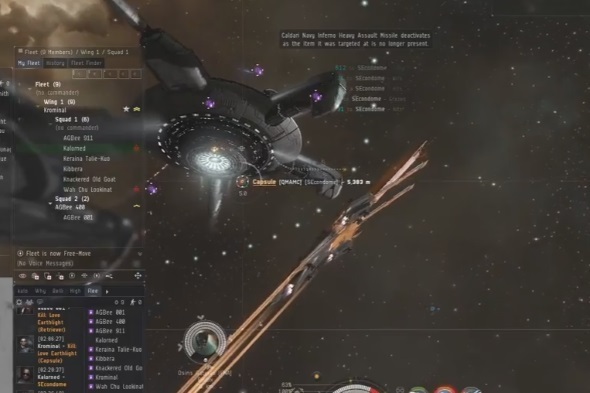 Some of us hunt freighters, some of us hunt ventures, some of us want to kill them all, some of us want to hunt down white knights, while others enjoy talking in local while station trading, and some others love to wardec carebears. We all have one thing in common. The Code. There should be a zero tolerance on drama, but at the same time we should try to include any corporation that enforces the Code. The CEO's of the other corps don't need alliance hanger rights. They don't need moderator rights in minerbumping. 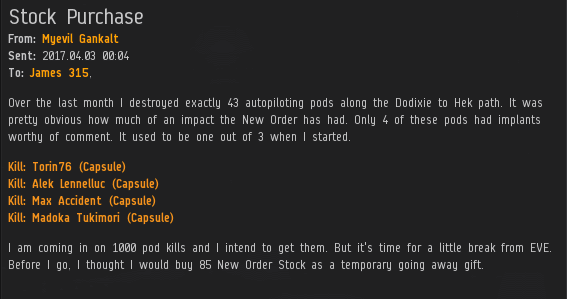 We don't need their loot either, they can buy shares and have their corp featured on the blog. We should stop creating drama for ourselves, praise James, and move forward with building a better High Sec. I guarantee you we will have a lot more fun. Knights of the New Order let us stand together with James 315. Thanks to Kalorned for continuing to inspire and enthuse us with those breath-taking videos of his! Please give AGBee 666's video a visit; it's something really different, refreshingly original and entertaining. Can't recommend it highly enough. Thanks also to Hrothgar for his full-on support and encouragement, and to Tweeps for being both the fuel and the glue! Ja, wir werden das Reich der Zukunft gut machen und die gierigen Bergleute entfernen. Wow, can't believe CHODE is still around. When will you all grow up and give up on the scam that Jamey is perpetrating? You haven't.,.,.,. You have been banned,.,.,.,. twice. Soon to be three times,.,.,. Too dumb to see it.,.,.,. Normally this would elicit an appropriate movie/theatre quote here but I think that it would just go over the heads of the AG crowd. The code cannot be put down, it is the full force of der reich of James 315, it will cleanse New Eden of der Bergmann, Heil James. So whats being said here is Wolf is a failure, huh kinda explains his fixation on AG. That was a masterful debunking of several oft-repeated myths. There's no good reason not to have a permit when you live in James 315 space, or even if you just pass through occasionally. He owns the space now, YAY I need a good space condo and a good parking spot and several lifetimes worth of tacos! I hope he shows a video of that one! That would truly be a good fight! Note: Looks like Zopiclone bought the farm at the same time as Kalorned. Good double kill by Iliad D'jax. Nice way to round out the month with a 2 code fail. Ein Aktienbericht, der eine große Schirmherrschaft für die New Eden Nazis zeigt, und eine weitere Verkaufsanzeige, ich denke, das ist, wie sie echte Weltfinanzierung für ihr Spiel bekommen.